Late-life insomnia is a serious medical condition associated with many untoward consequences. The high prevalence of late-life insomnia, along with the concomitant risks inherent in the use of hypnotic medications in older adults, necessitates non-pharmacological (i.e., psychological) treatment options. We aim to summarize and evaluate the state-of-the-science of psychological treatment options for late-life insomnia. Cumulative scientific evidence suggests the efficacy of psychological treatment of late-life insomnia. During the previous decade, trials of psychological treatments for insomnia have begun to test various modifications to treatments that have the potential to improve access for older adults, along with expanding their focus to include individuals with comorbid conditions that are common to older adults. While these modifications represent positive advances in the science of treatment for late-life insomnia, the evidence is still largely explanatory/efficacious in nature. Psychological strategies represent the best approaches for the treatment of late-life insomnia. Future investigations would be wise to progressively move towards increasingly pragmatic/effectiveness investigations, adding to the literature base regarding the treatment of late-life insomnia under usual/real-world conditions as opposed to ideal/artificial conditions. Sarah C Griffin, Scott Ravyts, and Bruce Rybarczyk declare no conflicts of interest. Joseph M. Dzierzewski was supported by a grant from the National Institute on Aging (K23AG049955). No other authors report commercial or financial conflicts of interest. Chen T-Y, Lee S, Buxton OM. A greater extent of insomnia symptoms and physician-recommended sleep medication use predict fall risk in community-dwelling older adults. Sleep. 2017;40. https://doi.org/10.1093/sleep/zsx142. Martin JL, Song Y, Hughes J, Jouldjian S, Dzierzewski JM, Fung CH, et al. 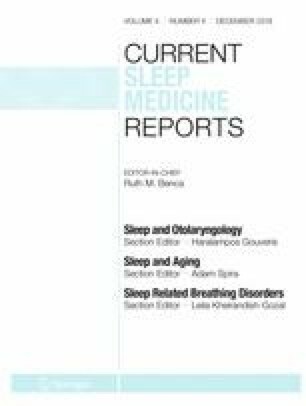 A four-session sleep intervention program improves sleep for older adult day health care participants: results of a randomized controlled trial. Sleep. 2017;40. https://doi.org/10.1093/sleep/zsx079. • Sadler P, McLaren S, Klein B, Harvey J, Jenkins M. Cognitive behaviour therapy for older adults with insomnia and depression: a randomized controlled trial in community mental health services. Sleep. 2018;41. https://doi.org/10.1093/sleep/zsy104. This study is the first study to show that older adults with comorbid insomnia and depression who receive CBTi with an additional mood module do not appear to benefit from greater reductions in insomnia or depression severity compared to individuals receiving only CBTi.